Does she or doesn't she? Only her hairdresser knows for sure. 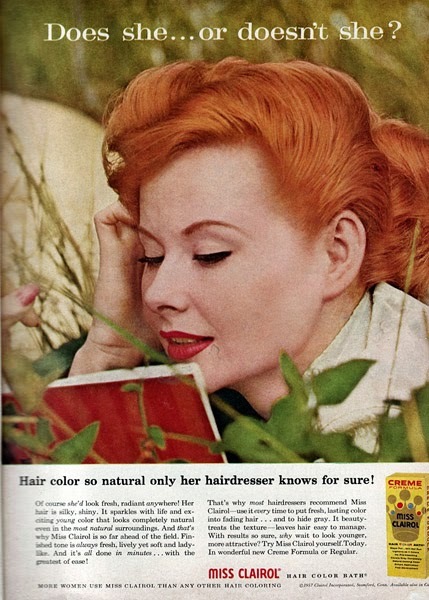 If you are old enough to remember that ad, you are old enough to remember when stylists were called hairdressers. The ad was referring to coloring hair, not confessing sexual escapades to your hair stylist. 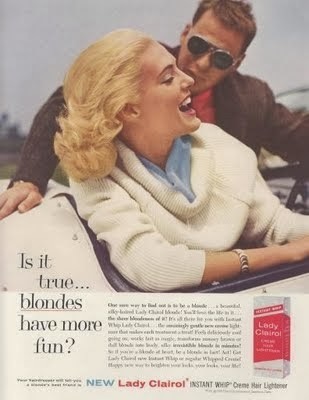 Is it true blonds have more fun? Be a blond and see! This ad was a real downer for brunettes. It featured the poor wallflower with brown hair, all alone in the corner, while the vivacious Marilyn Monroe look alike was getting all kinds of play from a group of frat boys. The brunette goes home, bleaches her mousy locks, and guess what! The boys start swarming! Wow. You've come a long way, Baby. I must confess. Over the years I have spent a fortune on coloring my hair. First it was just adding a few streaks to 'brighten" things up. Then it was a little highlighting. Then heavy highlighting. Then the grey appeared, and it became covering the grey, with highlighting on top of that. I couldn't get out of the salon for less than $100. Okay, I'll be honest. $125. Minimum. My hair still wasn't right. The color would only last a couple weeks and then look dull. Or worse, covering the grey turned my hair orange. I finally went to an ultra fancy salon that claimed to have products that would make my hair look like spun gold. The products are expensive, I was told, but my hair will be the color of Jennifer Aniston's. I swear, she said that. Three hours and $350 later, I walked out of the salon with hair the color of a shiny copper penny. Excuse me? What happened to Jennifer Aniston? That's when I decided that I could turn my hair orange myself, thank you, without spending $350. So, I did what I do best. I researched. I read thousands of reviews. I learned all about hair coloring products, ingredients, techniques. My hair is baby fine and thin. I couldn't afford to make a mistake and have my hair fall out. I finally found a product that I felt was safe. I tried it the morning of my son's graduation. Yes, I know it was crazy. It was either that or go to graduation with two inches of salt and pepper hair coinciding with blonde, highlighted hair. I was terrified. It was easy to use. The directions were very clear. Put the mixture on the grey part using the pointed plastic bottle. Leave it on 20 minutes, then put the rest on the remaining hair. Wait another 20 minutes and rinse. My hair was...dare I say it....the color of Jennifer Aniston's. I kid you not. 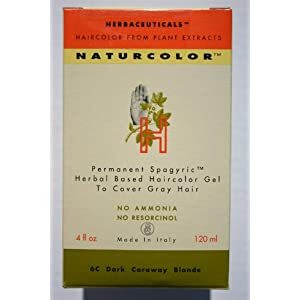 The product is called Naturcolor by Herbaceuticals. It's imported from Italy. I got it originally at Whole Foods, but many WF don't carry it. I ended up calling the 800 number to find a store in my area. You can also find it on Amazon.com. The 800 number is the key. They are experts at picking out the correct color combo that you need for your kind of hair. The cost for one box is $17. It contains enough product for me to use it at least twice. Which means it now costs me $9 (including tax) and one hour of my time to color my hair. Everything you need to do it yourself is in the box. Believe me, this is easy. It comes with plastic gloves and little bottles of great shampoo and conditioner that make your hair extra shiny. I haven't had a salon color my hair since January, 2011. My hair is healthy and the color is really natural and pretty. And I have saved over $600. Is it true blonds have more fun? This blond has a lot more fun with $600 in her pocket! That's a few days at a B & B in Italy! BE CAREFUL! There is also a Naturtint and a Herbatint. They are NOT the same. I have tried them both and they are by far inferior. For the Naturcolor website, click here. I commented on Annie's hair color the other day and told her how pretty it was. No kidding! It looks great. I use this product too and love it. Do you use the molecular infused hair cleanse that Herbaceuticals makes? If not, what shampoo do you use? If you call the Naturcolor number, 800-784-8212, I'm sure they will be able to tell you how to get the shampoo. I personally like a shampoo I picked up at Body Shop called Rainforest Radiance for color treated hair. Annie, what two colors did you blend together, and what shade did it produce on your hair -- which looks medium blond? I started with 8N, Yarrow Blond. After a while it started turning my hair red, so I mixed 9N with 8C. I've also used the gold colors, 8D. I read lots of reviews to see how people liked this product. Thanks, Annie, for your input! I just tried 6N a few days ago after having used henna/indigo for over a year (and having about a 5-6 week break from all hair color). Naturcolor was so easy, and turned out great! Henna is better on paper, but man is it a pain! For anyone coming from the henna world, the transition back was easy. I called the hotline, and they were very helpful picking out a color and telling me how to make sure my hair was ready for the new color. They told me I should put plain natural yogurt on my hair, wrap it and keep it on there for an hour. Then wash it out and let it dry. Then I could use their color on my clean hair. I mixed the whole container, but only needed 1/2 of it for my just past shoulder-length hair. I'm going to only mix part of it next time, and may go for a slightly lighter color (6N was fairly dark). Great information, Debs! Thanks for sharing your experience. You mentioned that you combined multiple colors, and when I was reading the amazon description, it also mentioned combing the shades (R, C, ect.) with the natural (N). How would you do this combination? Everyone's hair color is different, so I would call the company and describe your hair and what you want to accomplish.